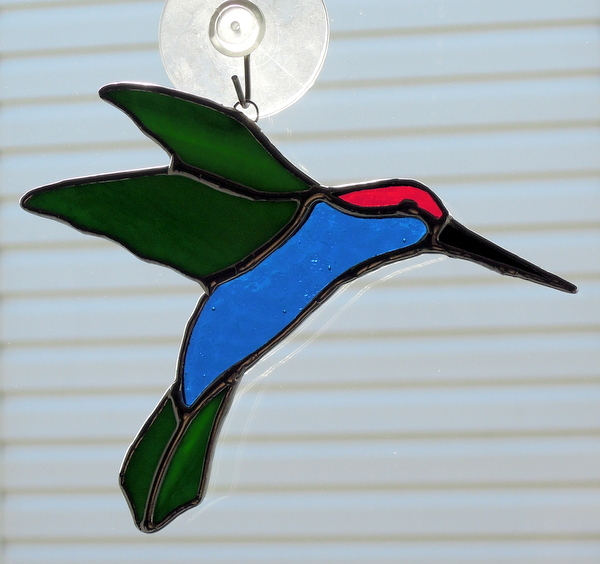 Here is a hummingbird we made this fall for the Wild Bird Store located in Calgary. We used a Spectrum iridescent green for the wings and tail feathers. In order to provide longevity for this bird, strengthening braid was soldered in against the bottom of the body and beak. 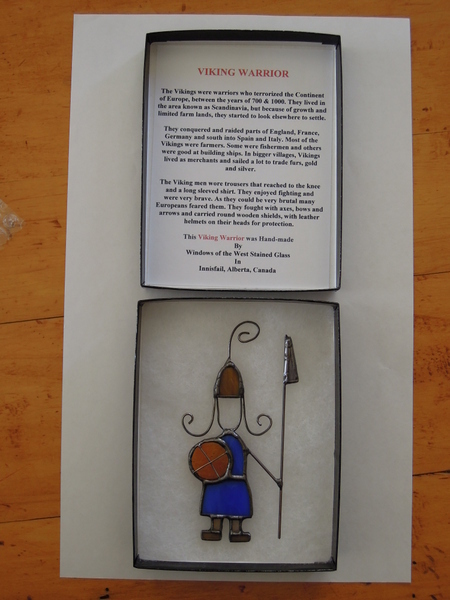 To compliment our boxed Viking Ship we made this Boxed Viking Warrior in the spring of 2013. 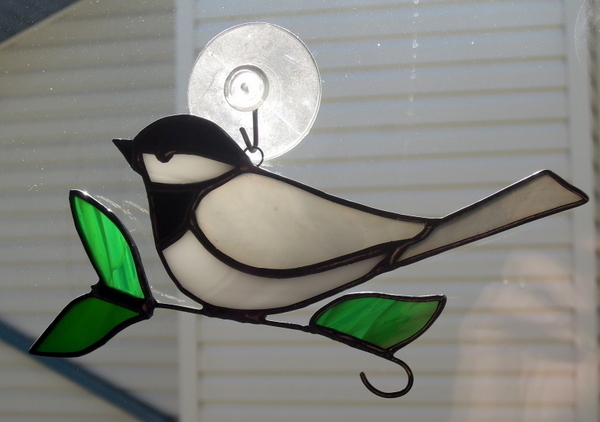 Chickadee on a branch was made this fall for The Wild Bird Store in Calgary. A piece of copper wire was used for the branch. 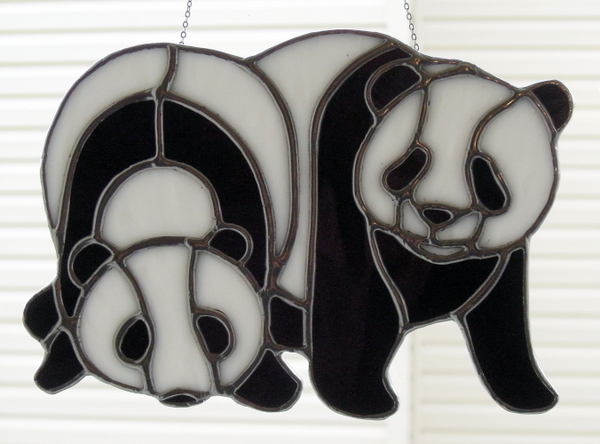 A client wanted sun catcher Panda Bears as a gift and this is what we made for her in September 2013. They measured approximately 6.5 inches wide by 4.5 inches high. 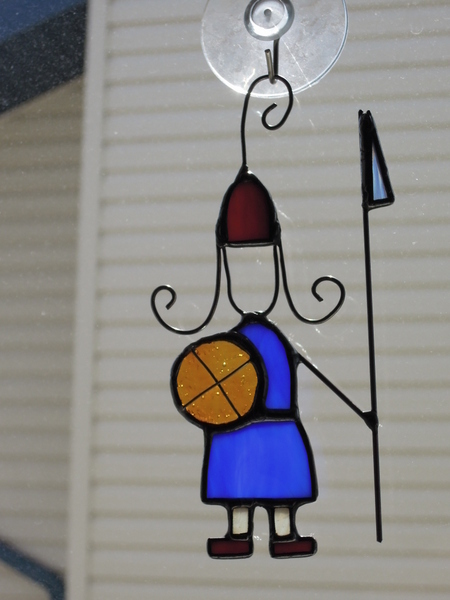 We used Wissmach white and Spectrum Black Waterglass and Black Cathedral glass, complete with a fine silver chain soldered into the backside seams for hanging. 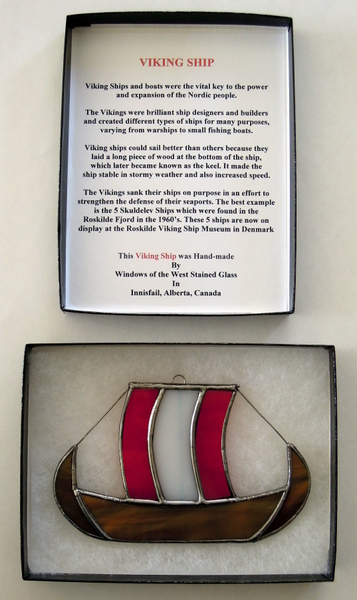 In May of 2013 we were asked by a long time Danish friends if we could come up with a Viking Ship. They had seen our Boxed Alberta Rose, Maple Leaf, Great Horned Owl and Rainbow Heart and wondered if we could do the same with a Viking Ship and also a Viking Warrior. Our friends have used them for Danish fundraising. Just west of Innisfail at Dixon Alberta is the Danish Canadian National Museum & Gardens. One should visit this wonderful Museum when in the area. Not far from Dixon lies Historic Markerville with it’s Historic Markerville Creamery Museum, Historic Fensala Hall, Historic Markerville Lutheran Church and the Historic Tindastoll Cemetery, all of these Markerville sites are operated by The Stephan G Stephansson Icelandic Society. Also close by is the Provincial Historic Site of the home of Stephan G. Stephansson.